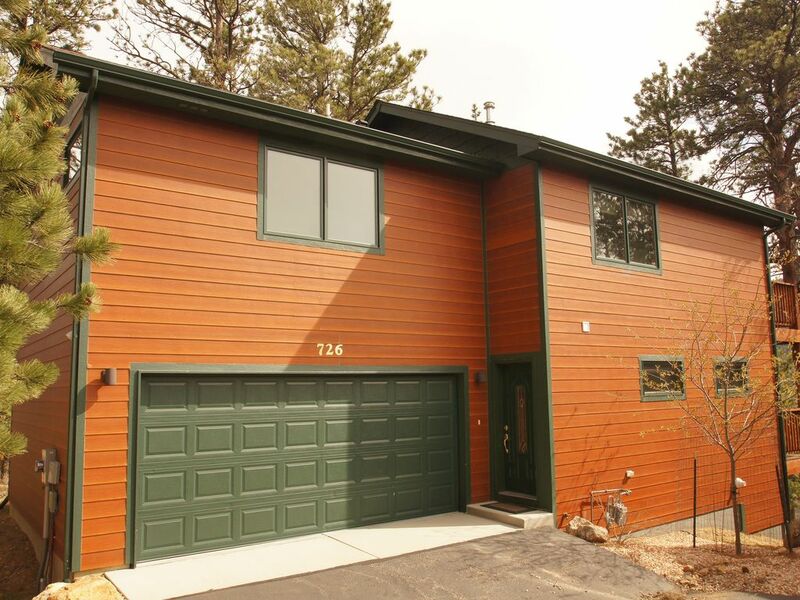 Registration number (6088) Beautiful, new townhome within minutes to Rocky Mountain National Park and walking distance to the town of Estes Park. Newly constructed with upgraded finishes throughout. The covered deck's provide a perfect place to enjoy the breathtaking views of the Continental Divide, and bbq on the grill. This home has a living/dining/kitchen in the main living area with an additional 1/2 bath and double car garage. The upper level has a loft with sleeper sofa that looks out to the view and down to the gas fireplace in the living room. Also upstairs is the master bedroom with king bed, sitting area and full bath including a jetted tub. The queen bedroom is also upstairs and shares a 3/4 bath with the loft area and has a private balcony. The lower garden level has a full bath, an entertainment area with sofa sleeper and tv. The lower level also has a third bedroom with a set of bunk beds. This unit does have free wireless internet service. Mountain View. Other Amenities: Snowshoeing, snowmobiling, sleigh rides, many outdoor concerts, Basketball Court. I have other units that are pet friendly, see owners website. Other Activities: Snowshoeing, snowmobiling, sleigh rides, many outdoor concerts. Great property - as expected. We had a great stay at this condo. There is a lot of space and everything was as expected. The house was very clean and had everything that we needed. We had a small problem with the iron and Steve delivered a new one without being asked to do so. I would for sure stay here again! My husband and I stayed here with our 2 adult children. There was plenty of sleeping space and bathrooms. The home is very nicely decorated and clean. The location to downtown shopping is great - just a 5 min drive. We especially loved sitting out on the balconies. The view of the mountains from the upper balcony was beautiful. We all had a great time! 1. Owner is not flexible. We asked if it is ok to give us extra 30 min for packing, he said he can't. 2. TV is analog TV, with several shopping channels. No news channel, no sports channel. We had to sit in a tight circle in front IPad to watch NFL. 3. When signing the contract, $750 was charged for safety deposit, but only $500 returned, even the owner said no any damage. 4. Downstairs room is not heated enough, if you want that room to be warm, the rest of the house you feel grilling. I am so sorry you were not satisfied with your stay. Regarding late check out we cannot always accommodate last minute check-outs due to cleaning schedules and possible guest check ins. I checked you invoice and you were not charged 750 for a damage deposit. You were charged 500 which was returned to you. The heating system is in working order. I am sorry you could not get it to function to your liking. I wish you would have contacted the property manager while you were experiencing the problem so a technician could have diagnosed what the issue was while you were experiencing it. We hope you give us another chance in the future. Thanks for staying in our home. We hope you had a wonderful time. How could we have made your stay a 5 star experience? Slept eight very comfortably. Away from busy downtown area. Close to grocery store. Well maintained property in a convenient and beautiful location. 2 blocks from The Stanley Hotel. 1 mile from downtown. 4 Miles from Rocky Mountain National Park. Approx 75 miles from Denver International Airport. Other Activities: Cross Country Skiing, Wildlife Viewing, Health/Beauty Spa, Boating, Downhill/Alpine Skiing, Rock Climbing, Racquetball, Miniature golf, Shopping.